Located on Interstate 20 twenty miles east of Dallas, Talty, Texas, is suitable for those seeking large residential lots within easy commuting distance to the urban center, and as such, the city constantly is assessing road conditions in order to incorporate improvements and ongoing city road projects and expansions. As part of its first ordinance in 2017, funded by the first city bond ever to be provided (in 2016), the Talty City Council authorized funding for an expanded roadway improvement project. Bids for the project were opened to the public in February, and a bid that allowed for construction to begin late February was accepted. Project enhancements included significant drainage improvements designed to better protect residential properties from rising water during heavy rains along Laydens’ Ridge Drive, Michael Talty Ave. and Cleaver Lane. The roadway enhancements included new asphalt paving, resurfacing the existing roadways and the construction of a new concrete cul-de-sac, as well as additional culverts and ditch grading to help with the improvement of drainage to the area. Along Layden’s Ridge Drive (County Road 213), an existing culvert was severely deteriorated, and the city determined it was in need of repair and/or replacement. BGE Inc., the engineer of record for the Talty roadway improvement project, reached out to Contech Engineered Solutions, a company that has been involved with relining drainage structures since the 1930s, to identify possible solutions. Having had previous experience with Contech, BGE was confident that the right solution would be available, given the wide variety of materials and pipe types manufactured by Contech. The two-lane road was not a major arterial road. However, given the nearby location of a private residential subdivision, it was critical that the road be kept open for the local residents. Considering this aspect of the project, BGE Inc. looked into the possibility of relining the existing culvert. Because rehabilitation and relining a drainage structure can be complicated, with no “one size fits all” solution, every reline project requires a site-specific analysis processed by qualified professionals. Upon consultation with Contech, BGE Inc. selected Aluminized Steel Type 2 (ALT2) spiral rib pipe due to its hydraulic efficiency and minimum 75-year service life. The profile of the spiral rib pipe would provide a smooth interior, improving the hydraulic capacity capable of a Manning’s “n” of 0.012, equivalent to that of concrete pipe, while the exterior box ribs provide the structural strength. Adding to these inherent benefits, this type of pipe also is an economical pipe reline solution. Upon the decision to proceed with the use of spiral rib pipe, the local Contech manufacturing facility fabricated the pipe that was needed, and it was quickly delivered to the site location. The installation of the spiral rib pipe in diameters ranging from 48 to 96 in. was performed by Chiener Construction LLC in accordance with AASHTO Standard Specifications for Highway Bridges, LRFD Section 26, and conformed to the project plans and specifications. The pipe included manufactured grout ports and caps to simplify the grouting process. Once the new liner pipe was delivered directly to the site, the installation was performed by the local contractor who utilized a simple block-and-bracing method along skid rails to push the liner pipe directly into the host pipe prior to grouting. Grouting was another important part of the relining process. Once the grout was properly set, the new spiral rib liner pipe provided a fully structural solution. extending the life of the existing culvert for an additional 75 years, minimum. 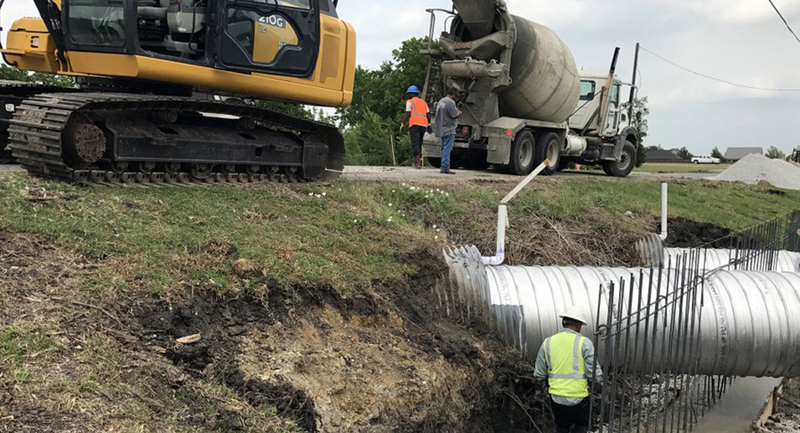 The decision to reline the failing culvert saved the city a significant amount of time and money while also keeping disturbance to the surrounding community to a minimum.